Hello Friends, I meant to check in yesterday, but I had an Engineer vs. Artist moment (thus the name of the quilt for now), and the Artist won. You see, when piecing is involved, I am all engineer because of the precision aspect of things. Then, when it comes time to decide what to quilt, oftentimes the engineer within me takes over for the efficiency aspect of things, due to project deadlines, and I have to be efficient with what I quilt within the amount of time I have…. but yesterday, the Artist in me won! I was already late because the piecing took longer – piecing ALWAYS takes longer for me because I am a snail-speed piecer. I knew I had a limited amount of time to quilt the quilt. I could just quickly quilt an allover motif, and be efficient, or I could go all out and quilt fancy, and really add to the quilt. The battle raged on fiercely (! ), and finally, the Artist won! I won’t tell you how much sleep I got last night, because I will get in trouble should my Mom check in and read the post. ;) But suffice it to say all those all-nighters I had in engineering school amply prepared for a stint like last night’s! I was glad the Artist in me won in the quilting department of this quilt. I really like the result. But the icing on the cake was when Miss Baby came downstairs and saw the quilt this morning… she said, “WOW, Mom…. this quilt is so pretty now (that it’s quilted)!” I guess she wasn’t quite sure about it before, and was too nice to say anything negative. 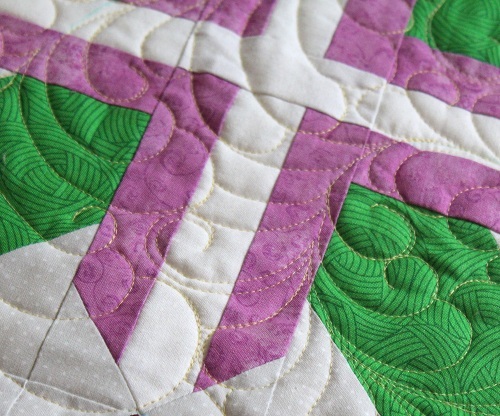 This quilt is now on its way to the editor. Whether they would let me officially name the quilt “Engineer vs. Artist” remains to be seen. Thank you for stopping by! I need to start on the next few things on my list. I shall catch up with you later. p.s. 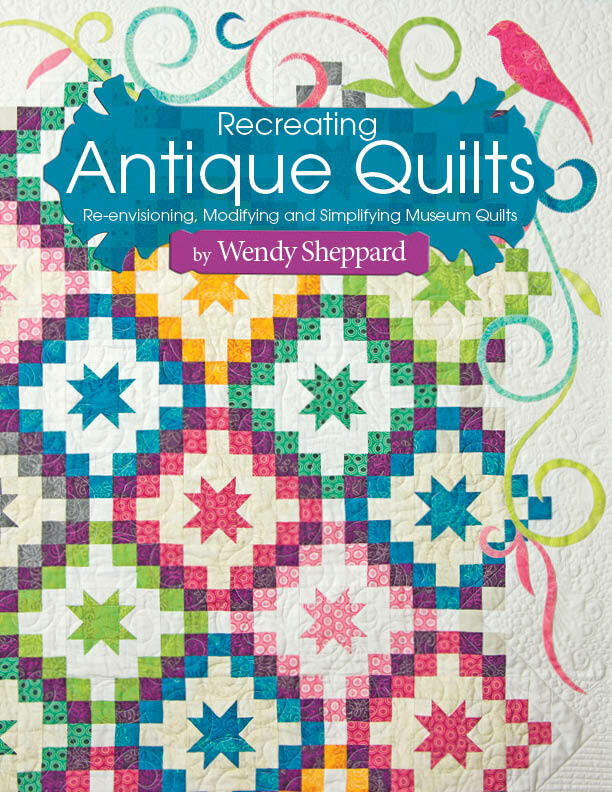 Through today only, you can still get my book Recreating Antique Quilts at a discount at my publisher’s website. Click here to purchase the book. This entry was posted in Quilting, Quilts & Projects: Upcoming and tagged Feather Wreath Quilting, Landauer Publishing, Quilting, Recreating Antique Quilts, Wendy Sheppard. Bookmark the permalink. Without even seeing the front, the all nighter paid off. I agree with Miss Baby–WOW! Can’t wait to see the complete quilt. Hope you get some sleep today and a good night sleep tonight. Your artistic quilting is absolutely amazing. I am in awe. Envy envy envy! I love to open my e-mail and find another quilt you are working on. 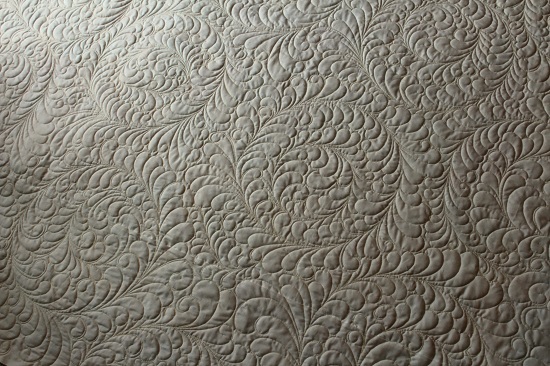 I love the beautiful quilting. You inspire me every day. Gorgeous feather wreaths!!!!!!! And I love that they are not the traditional, static design, but a swirly design with lots of movement. Just beautiful. Look forward to seeing the front! I suspect that your Monday evening ladies were in awe with your trunk show. How I wish that I was closer. “Rain, rain go away, come again another day.” In fact we just had a moment of hail. Guess that this weather will be good for the numerous bulbs that I planted yesterday. Oh boy…I bet your eyes are tired! I hope you can get a few more hours tonight! Holy Feathers Batgirl!!! That is beyond beautiful!! Beautiful. Hooray for the Artist! I’d like to email you about a quilting challenge I’m facing. What’s the best way to do that? Thanks.